One of the more surprising twists in a surprising year is that despite the obvious Republican disadvantages in this election cycle, John McCain is matching up pretty well against Barack Obama and Hillary Clinton in tests being conducted by national polls. Pew Research Center and CBS/New York Times polls show Obama and Clinton holding only modest leads over McCain, while other national surveys — notably Associated Press/Ipsos and NBC/Wall Street Journal — have McCain running about even against the Democratic candidates. Electability is an issue, and one that both Senators Obama and Clinton are likely to use to woo the superdelegates. But our polling suggests that neither candidate has a demonstrable advantage to tout. Where and among whom each candidate ran particularly well in the primaries is certainly not much of an indicator of how they will match up against Senator McCain. Assuming a win in the Pennsylvania primary, the Clinton campaign can be expected to make the case that having won all of the major swing-state primaries, the former first lady is more likely than Barack Obama to carry these states in a general election. But a breakout of the results of recent surveys would argue otherwise. An analysis of Pew Research Center surveys conducted in late February and March finds the two Democratic candidates running about equally well against Senator McCain among voters in Florida, Ohio, Michigan and Pennsylvania. 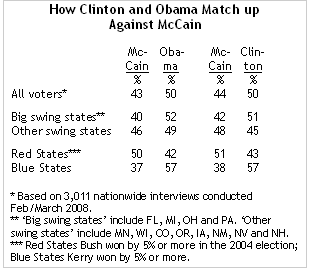 Obama led McCain 52 percent to 40 percent among a representative sample of voters living in these states, while Clinton bested McCain by a statistically comparable 51 percent to 42 percent margin.